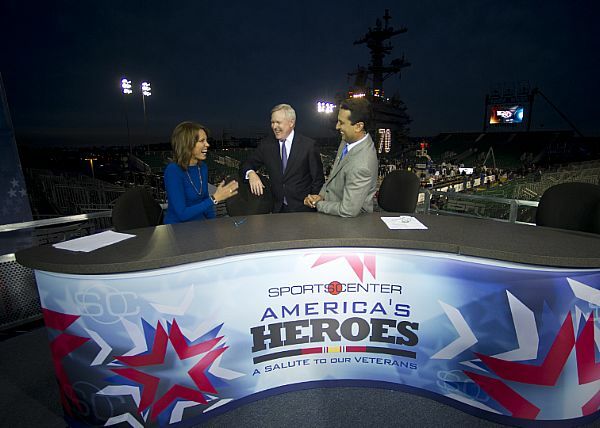 Navy Secretary Ray Mabus stops by the SportsCenter desk, visiting anchors Hannah Storm and Kevin Negandhi aboard the aircraft carrier Carl Vinson in 2011 as part of that year’s Carrier Classic. Storm and Negandhi are in Annapolis on Friday for a daylong ESPN takeover. The Naval Academy will host an all-day SportsCenter extravaganza Friday in honor of the show’s annual Veterans Day tribute, ahead of Saturday’s home game against Hawaii. Starting at 9 a.m. Eastern, tune in to ESPN for interviews with Commandant of Midshipmen Capt. Bill Byrne, Superintendent Vice Adm. Mike Miller, Navy football head coach Ken Niumatalolo and assorted midshipmen throughout the day, live from the T-Court on campus. According to the Navy football website, ESPN might also air a spot from New England Patriots head coach Bill Belichick, discussing his time growing up in Annapolis, Md., when his father, Steve, served as a Navy assistant coach. 9 a.m. – Opening of program by Hannah Storm from the broadcast set outside T-Court and Kevin Negandhi from the Rotunda. 10:30 a.m. – Interview with Byrne on the set in T-Court. Noon – Coverage of noon meal formation. 12:15 p.m. – Coverage of noon meal in King Hall, including possible interview with a midshipman at lunch. 2 p.m. – Interview with Niumatalolo on the set in T-Court. 3-6 p.m. – SportsCenter will rebroadcast various segments shown earlier in day. 6 p.m. – Discussion by anchors in T-Court of previously taped “Why I’m Here” interviews with midshipmen. May also include Belichick feature. TBD – Taped highlights of the women’s soccer Patriot League tournament game scheduled for earlier Friday, and a quick scene from the Marine Corps Birthday Ball. 7:10 p.m. – Wrap-up by anchors of the day’s coverage.